Outfitting your home with a high quality safe is one way to ensure that your valuables are safe all day, every day. While there are many options to choose from when it comes to selecting a safe, one very popular feature individuals choose is an electronic lock. What does an electronic lock offer that other locks don’t? The answer is simple—versatility. Forget about ever misplacing a key (although many models come with an extra pair in case of emergencies) because the safe is accessed using a numerical code or password that the administrator programs. They are much easier and faster to open than their manual counterparts. Plus, electronic safes can be adapted for multi-user functions which are suitable for homes where multiple individuals need access to the contents or even in a business setting in the presence of customers and other forms of traffic. Chubbsafes prides themselves on providing customers with top of the line safes and the quality standard which the Chubbsafe name is known for. 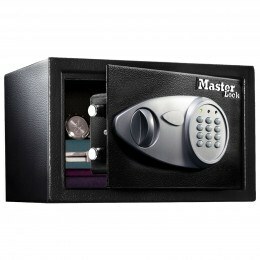 The Chubbsafes AlphaPlus Digital Locking Security Safe has a recommending cash rating of £3,000 or £30,000 in valuables. It’s designed to withstand up to 15 minutes of high heat. Be aware, however, that fire protection rating is determined by placing a fire resistant filling in between the body of the safe and the outer body. With that being said, it is geared to protect things like jewellery, collectables, cash, important documents and paper documents, again for up to the 15 minute. It receives a second tier Bronze assessment from Robert’s Ratings and is fitted for either base or rear wall fixing. In business for nearly 80 years, the Sentry name is a world-leader and pioneer in the development of safes. The Sentry X055 Electronic Security Safe is one of no stranger to durability, strength, and affordability. The re-programmable electronic lock allows you to create a two-eight digit combination and it is powered by alkaline batteries for easy routine maintenance. It has a cash limit up to £1,000 or £10,000 in valuables which is ideal for passports, small laptops, jewellery and other compact electronic devices. If you do decide to place valuable jewellery inside you’ll be glad to know the floor is carpeted to prevent any scratches of unintentional damage. It has a two year manufacturer’s warranty and is fitted for rear wall or base fixing. It’s important that you do fix this safe because it doesn’t weigh an enormous amount, only 7.7 kg. Sometimes it can be hard to find the right sized safe for electronic devices like laptops. Because of their wider orientation, a laptop may not fit through a traditional square shaped safe. When this is the issue, turn to the Sentry Digital Electonic X125 Security Laptop Safe. It has an internal width of 426mm and an internal height of 266mm. It’s engineered especially with laptops in mind, unlike some other burglar or fire resistant safes. It has an access point for laptop power cables, a cash rating up to £1,000 or £10,000 in valuables plus one removable shelf for additional space requirements. Like the previous Sentry safe, this one also doesn’t have an unwieldy weight so you’ll need to fix it in the rear or at its base. The re-programmable digital electronic security lock is sure to keep uninvited guests out and the two live locking bolts add an extra element of security. In the event that you forget the combination to the digital lock, you can use the emergency override key that comes with the purchase of this safe. The Chubbsafes AIR Laptop Security Digital Safe is another suitable electronic home safe. Constructed with a 2mm steel body and 4mm door, you’ll never likely find yourself questioning the security of this safe. It’s got an easy to operate electronic lock that can easily be reprogrammed, plus it uses standard batteries which can inexpensively be swapped if they go flat. Featuring an extra wide opening for those hard to fit computers, the Chubbsafes AIR has a 420mm internal width, 190mm internal height, and 300mm internal depth. As an added bonus, you’ll be helping the environment because for each purchase made, Chubbsafes will donate money toward the Carbon Clear organisation which is dedicated to the reduction of emissions including the harmful greenhouse gases. So not only will you feel peace of mind that your belongings are protected but you can also add the environmental components to the list of perks. The Phoenix SS0723E Compact Home and Office Safe is on the lower end of the price spectrum yet still offers adequate protection for up to £1,000 cash or £10,000 in valuables. The digital lock is user-friendly yet is advanced enough to prevent unwarranted access with its built in anti-tamper features. If the wrong combination is entered three times, the lock automatically enters into freeze mode which is a great feature to thwart thieves. Made using galvanised steel, the body is durable and strong as well as guaranteed for two years. 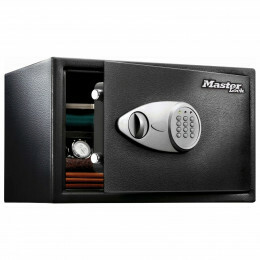 Overall, it’s an affordable yet secure solution for the safety of your valuables. The five aforementioned safes are all great options for protecting your jewellery, valuables, and sensitive paper documents. They come equipped with high ratings and the protection of names you can trust.